I told you here that I was loving my new Inglot palette a whole lot. I thought I would show you a look I did using the top row now, which is made of greyish bluish tones with a cream color and a cool brown. I used the cream as an all over base, the slightly silvery light blue on the lid, the brown in the crease and the dark, slightly purple blue (on the far left) as a liner and in the outer V.
Again, all shades are matte, but very pigmented and easy to blend. I am still absolutely thrilled with this palette and guess what: a new one is on its way to me! This time with warmer shimmery tone for some variety. I will be sure to keep you posted as soon as I get it and have played with it a bit. Finally, an all matte palette! Very hard to find oddly enough. The advantage with inglot is that you make it yourself! Can't wait to see the new palette. PS: is it sunny and warm already up there? for like the first time today, yes, although you don't really see the sun through the clouds but it's boiling! blue+brown FTW! What blush are you wearing? It is very probably the Chanel Blush Horizon from this Spring. I have an Inglot palette all picked out and ready to go, but everytime I get close to hitting the "purchase" button, I stop. I just feel so unsure about buying eyeshadow online without being able to see them in person. I have researched all the swatches, watched youtube videos, etc. etc. What was your experience? 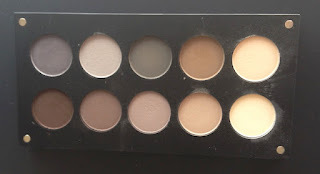 Did you find the eyeshadows true to the colors you selected? Well unfortunately I have no idea - I didn't chose my palette. I had a choice made based on swatched and the girl who was picking them in Poland didn't find what we asked for and let the sales assistant pick other shades instead. So neither my friend nor me got what we expected, in my case, quite the contrary as I wanted shimmery golds and browns lol, only the 2 far left and far right shadows are similar to colors I wanted. We got another CP and I haven't received the palette yet but we only asked for the kind of finish and colors we wanted, and nothing specific, it will be another surprise. The only things I can tell you is that pigmentation is good, and that I was advised to avoid the shimmer finishes as some do contain some big chunks of glitter, the pearl one should be much better. I'm wanted some of these, but know I'm glad I got to see these. You saved me big money! These look kind of dusty and dirty for my liking.